Flickr / AranamiNo more excessively long lines. There’s an easy way to skip the line at Starbucks. Just download the store’s app, pay for your drink in advance, and pick it up in the store — without having to wait in line. The app — which is also commonly used for tracking gift cards and rewards — is available for both iPhone and Android users and is pretty easy to use. The menu is all there, including calorie counts, flavours, and add-ons, so you can completely customise your drink just as you would if you were ordering in store. You can also order food. After downloading and creating an account, users simply go to the order feature, place their order, specify which location they will be picking their order up at, and then pay for their order with the credit card they have on file. The app will then say how much time is needed before the order is ready and will notify the user once the order is ready. 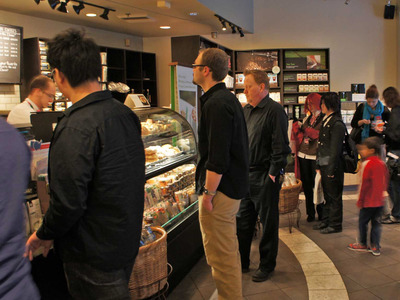 Picking up is as easy as walking up to the pick-up counter and asking the barista for their order.